You've just started your car trip with your dog or cat when you hear a particularly disturbing sound, followed by an unmistakable odor. Motion sickness doesn't just affect humans, but can also be a problem for our animal companions. Although the easy answer to the problem is "don't take your pet for rides in the car," it's not always possible to avoid car trips. These remedies can improve your pet's comfort during car rides and will help you keep your vehicle cleaner. Motion sickness can occur if the eyes, nerves and inner ear, the parts of your pet's body that detect motion, become confused. When a pet rides in a car, its eyes sense movement, even though the body isn't actually moving. 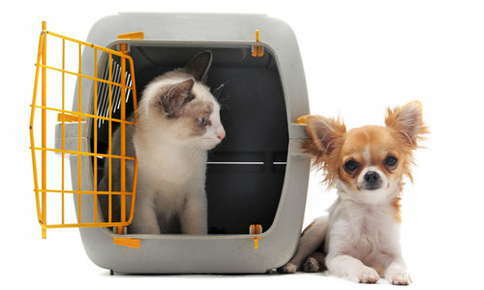 In some pets, this can trigger motion sickness symptoms. Motion sickness most commonly affects younger animals, although it can be a problem for animals of any age. The problem may also occur if your pet experiences anxiety when riding in a vehicle. If the only time your pet rides in the car is to visit the veterinarian, he or she may develop a negative association with the car and experience motion sickness symptoms due to anxiety. How Can I Help My Pet Cope with Motion Sickness? Improve the View. People and pets are more likely to become sick if they stare out a side window. Make sure your pet has a clear view out the windshield by placing him or her in the middle of the back seat. Be sure to safely restrain your furry friend with a pet harness or crate. Skip a Meal. If possible, don't feed your pet for four or five hours before the car trip. Continue to offer water, but don't offer food until you arrive at your destination. Turn Off the Air-Conditioning. Fresh air can help reduce motion sickness symptoms whether you're a pet a person. Roll down the windows a little and let your furry friend enjoy the breeze. Stay Away from Long and Winding Roads. The more the car turns, the worse motion sickness becomes. If there is more than one way to reach your destination, choose the route that offers the straightest path. Take a Break. During long trips, stop every hour or two. Give your pet plenty of time to walk around a little and drink some water before you resume the trip. If your pet was just beginning to feel a little sick, taking a break can help reduce or relieve motion sickness symptoms. Turn Riding in the Car into a More Pleasant Experience. If you suspect that anxiety may be to blame for your pet's symptoms, change the way he or she views the car. Place your pet in your stationary car for five minutes, then offer a treat. Once your pet feels comfortable in the car, go for a very short ride, followed by a treat. Gradually increase the length of the car rides, always offering a treat at the end. Once your pet becomes comfortable in the car, be sure to take him or her to fun places, like dog parks or the beach. Ask Your Pet's Vet About Medication. The same type of medication that people use to control motion sickness can also be helpful for pets. Don't give your pet any over-the-counter supplements or motion sickness medications without checking with the vet first. Dosage amounts will vary, and the medication may not be recommended for some pets. Would you like to help your pet conquer motion sickness? Call us to schedule an appointment to discuss his or symptoms and treatment options.